Pop. 216. In Kaladar T., Lennox and Addington Cs., on the Skootamatta R. and C. Rd. 25, 79 km N of Belleville. Pop. 14. In Barrie T., Frontenac C., SW of Mississagagon L. on C. Rd. 506, 25 km. N of Kaladar. Pop. 329. In Kaladar T., Lennox and Addington Cs., on Beaver Cr. and Hwy 41, 62 km. NW of Napanee. Pop. 224. 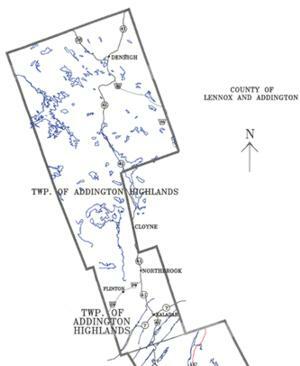 In Kaladar T., Lennox and Addington Cs., at the junction of Hwys 7 and 41, 47 km. NW of Napanee. Pop. 78. In Anglesea T., Lennox & Addington Cs. and in Barrie T., Frontenac C. on Hwy 41 2 Ian N of C. Rd. 506,53 km. NW of Napanee. Pop. 21. In Barrie T., Frontenac C., 9 km NE of HWY. 41, 21 km N of Kaladar.